Sample shown with Tangerine icon color and tangerine lining. Sample shown with Tangerine icon color. $52.80 $66.00 As Low As $1.34 ea. 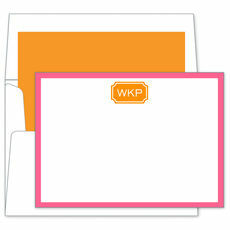 Set of 25 flat note cards with matching blank envelopes. Note cards measure 6.25" x 4.5". Your choice of icon color. Personalization in flat ink as shown. Return address and optional envelope lining available.